Out of all of the nine new Gorilla Perfumes, Furze was probably the one I was least excited to try. I’d never heard of a furze plant before, and the notes (vanilla and coconut) sounded a little Bath & Body Works. I was more interested in the darker-sounding perfumes, like Voice of Reason and Hellstone. But when I finally had the chance to try all nine scents last week, Furze immediately emerged as the standout of the collection. I’m not sure how useful my description of Furze will be, as it appears to smell very different to different noses. 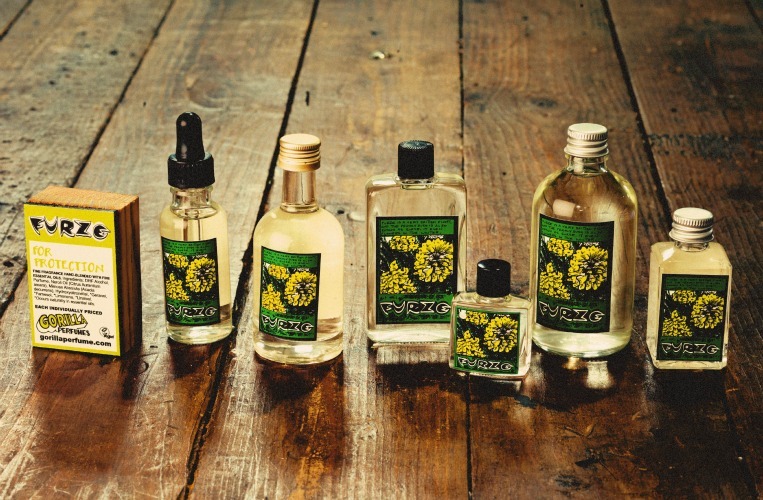 The Candy Perfume Boy described it as “incredibly crisp and green” in his review, while a Basenotes commenter called it “a gorgeous mimosa scent.” For me, Furze has that luminous sweetness that I typically associate with heliotrope scents, only without the powdery aspect that heliotrope often has. The Muse in Wooden Shoes once described the smell of her heliotrope plants as “jam-filled donuts”, and I think that’s a perfect description for Furze. Although I would love to smell The Candy Perfume Boy’s crisp and green version, Furze never deviates from sweet and creamy on my skin. In addition to being one of the most enjoyable new Gorilla Perfumes, Furze also happens to be the cheapest. The smallest size is $14.95, and the largest size (3.1 oz/91 ml) is only $44.95! As usual for Lush fragrances, Furze has excellent lasting power. Even though Lush isn’t making it easy for you to try Furze (it’s only being sold in 15 out of Lush’s hundreds of North America stores), it’s definitely worth seeking out. That’s the best thing a perfume blogger could hear, P&P! Please let me know what you think once you’ve tried it! They didn’t have this at my local Lush (booo) but I’m really curious about it. I love coconut notes! My Lush store still doesn’t carry the new perfumes, but they now have testers! They’ve only had them for about a week, so if you haven’t been to Lush in the past week, you might be in for a pleasant surprise next time you go! I bet the SXSW participants smelled much better this year than in years past! 🙂 I think you would remember Furze if you had tried it. A few of the new scents were pretty similar to each other, but nothing else smelled like Furze. So you have a totally legitimate excuse to go back and try them again! I didn’t see these at the Lush store in Georgetown, but I’ll check again. Lust is the only Gorilla perfume I have. (I like Karma too.) But Gorilla perfumes are so cheap and unique, it’s like shopping at an old drugstore. They’re not being sold at Georgetown! The closest Lush store to us that sells them is several states away in either direction!! I really don’t understand this whole limited release thing. Would you say that Karma has more orange or patchouli? It’s probably the Gorilla Perfume I’ve spent the least time with. I haven’t tried any of the Gorilla scents but my interest has been peaked, especially at 14.95! Love that. Furze sounds fun. You should definitely try them, Sujaan! I believe that one of the NYC Lush stores carries all of them. (Pops head up ) Jelly doughnuts?? In a bottle? Oooooh. Too bad I don’t have a LUSH store. Having a Lush store wouldn’t even help you, Mals! I wish they were selling a sample set of these, like they did with the Exclusive Gorilla Perfumes a year or two ago. My local Lush has the testers but isn’t selling the perfumes, which is kind of annoying. I think Austin and New Orleans are the closest stores to me that are selling them. I didn’t try Furze last time I was there, but I did try a few of the others. I think of the testers I tried, Sikkim Girls is the only one I would buy, though I liked The Bug too. The Voice of Reason was straight up barbecue sauce on me. Your description of Furze does sound pretty nice, so I’ll give it a try next time I’m there.